CICH graphic created using data adapted from OECD. Greenhouse gas emissions by source. http://www.oecd-ilibrary.org/environment/data/oecd-environment-statistics/greenhouse-gas-emissions_data-00594-en?isPartOf=/content/datacollection/env-data-en – accessed February 15, 2017. The country with the highest per capita emissions was Australia, with 22,200 kg of greenhouse gas emissions per capita. The lowest was Mexico. 1OECD. Greenhouse gas emissions by source. 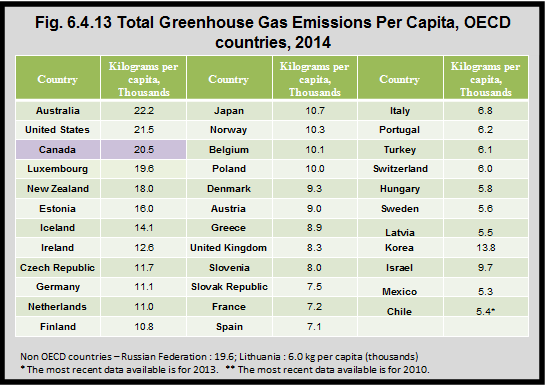 http://www.oecd-ilibrary.org/environment/data/oecd-environment-statistics/greenhouse-gas-emissions_data-00594-en?isPartOf=/content/datacollection/env-data-en– accessed February 15, 2017.